Posted on Fri, Apr 16, 2010 : 8 a.m. 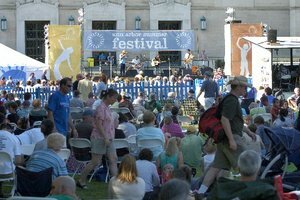 The Ann Arbor Summer Festival today announces its full schedule for Top of the Park, the free, outdoor part of the event. This year ToP again returns to its location along East Washington Street east of State, at the Rackham Building and Ingalls Mall (see the map at the end of this story). And while the basic outlines — live music and, during the week, movies on an inflatable screen —Â remain the same, some previously reported changes will also be seen. View the entire ToP schedule (PDF). Top of the Park runs Friday, June 18, through Sunday, July 11. There will be no ToP on Mondays this year, but the event will start earlier (5 p.m.) on Fridays, Saturdays and Sundays. Tuesday-Thursday's start time is 6:30. The last night of Top of the Park 2009. Although there continues to be no formal admission charge, donations will again be encouraged: Suggested donations are $3 per individual or $5 per family for each visit. The festival has a goal of $45,000 in donations this year, up from last year's gifts totaling $40,000. According to the announcement from the festival, this year’s Top of the Park season is anchored by 49 music and dance acts, 8 guest DJs, and 13 feature films. Three-fourths of the artists are locally based. Some highlights include local favorites Macpodz, Orpheum Bell, FUBAR, Mr. B, and Madcat & Kane. This year, festival fans voted on the movie lineup, which spans the gamut from the classic "Casablanca" to the cult favorite "The Princess Bride" and the recent smash "Avatar." New this year: Each Thursday, the festival will team up with the Ann Arbor Film Festival to screen 15 minutes of shorts before the feature. New attractions this year include ReTreat, a new health and wellness program featuring mind/body sessions such as yoga on the lawn, tai chi, Pilates, and more. A portable climbing wall on Ingalls Mall will be staffed by Planet Rock from June 25-27; and an extreme sports thrill show performed by Craz-E-Crew Stunt Team featuring professional BMX riders, skateboarders, and in-line skaters is set for July 3 and 4. In addition, the festival has teamed up with the syndicated radio show "Acoustic CafÃ©" for special up-close concerts. Returning Top of the Park features include the Grassrootz Stage, an emerging artist space to showcase local teen talent; After Dark @ Top of the Park, a series of late-night DJ sessions in The Grove area of the beverage garden on Friday and Saturday nights; and KidZone, an activity tent for children and their parents. Food vendors will also return, this year including Oasis Deli, Rendez-Vous CafÃ©, Stucchi’s, Sugar Shack, Silvio’s Organic Pizza, Sweetwaters, Ray’s Red Hots, Tios Mexican CafÃ© and others. The festival’s opening night celebration, First Friday, which takes place on June 18, includes a 30-piece marching band procession with Chicago-based circus punk ensemble Mucca Pazza, followed by a street dance party with local favorites My Dear Disco. The festival had earlier announced this year's slate of paid, ticketed shows. Sat, Apr 17, 2010 : 3:37 p.m. I have always been pleased with the movies shown at the Top of the Park but this year they don't seem as good. Fri, Apr 16, 2010 : 10:52 p.m. I always look forward to the movies. But this year I am not too excited about the line up. Only a few stand out. And the "classics". Bah. Casablanca and West Side Story? No thanks. It is cool that people got to vote this year. I wonder what the stats are, like how many people actually voted. Fri, Apr 16, 2010 : 1:15 p.m. I wish they would go back to showing movies on weekend nights. Fri, Apr 16, 2010 : 9:36 a.m.
TOTP is such a great event, one of my favorite things about living here. Having said that, I'm really underwhelmed by the lineup this year. It's just kind of stale. I would also argue that we might be over saturated with locals for these things. I'm a big supporter of hometown bands but we are blessed with multiple outlets for seeing most of these acts every week. The Top schedule could use a big dose of good regional or national acts. Given the economy, you could get them for the same price too. Look at the stuff Circus is booking on Wednesdays.